ACRLog welcomes a guest post from Megan Mall, Director of Content Strategy at the American Association of Law Libraries. In my previous position, I worked as a librarian in a university career center. In short, I helped students locate companies of interest and prepare for interviews. The idea that a librarian could help students with their career pursuits was initially something of a mystery to them. But once they saw the caliber of information available through subscription databases and the librarian’s expertise at work, they were converts. They excitedly provided updates on job offers. They wanted to know what databases to use for research projects and hobbies. Providing career research assistance was a highly effective entry point to the library for most of the students I worked with. Words like “database” and “online resource” that were simultaneously prosaic and nebulous became meaningful as things that offered near-immediate benefits. And, really, who would argue with a service that saves you time, makes you look smart, and helps you land a job? In addition, providing career research assistance was a fantastic way to demonstrate the library’s importance to outside stakeholders through usage statistics, satisfaction surveys, and student testimonials—not to mention the indisputable currency of helping students land jobs. Though I worked with MBA students in the role, I relied upon a few foundational resources that are available through many undergraduate and public libraries. I’m going outline how to use them to launch your own career resource center. Sue Ellen “Swell” Crandell will graduate from the University of Minnesota-Twin Cities with a degree in marketing. She’s interested in finding a job in Seattle. First, we want to see what’s out there—in Seattle—using Hoover’s. Hoover’s is a multi-purpose resource that can function as a company directory. 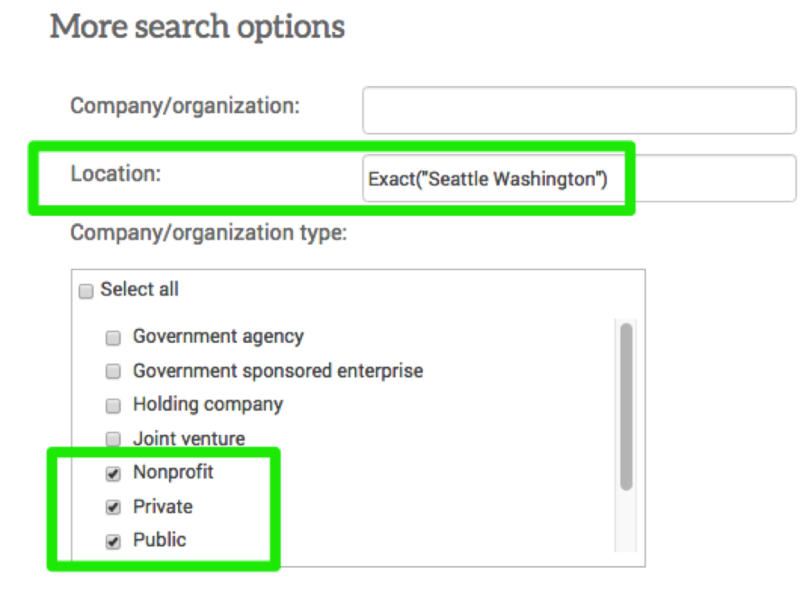 From the “Advanced Search” screen, I added a few filters, and Hoover’s generated a list of over 100 companies. The list includes companies like Nordstrom, Starbucks, Amazon, and Microsoft. Swell decides to focus on software companies. IBISWorld is a great go-to resource for industry knowledge. The reports are typically updated several times per year. 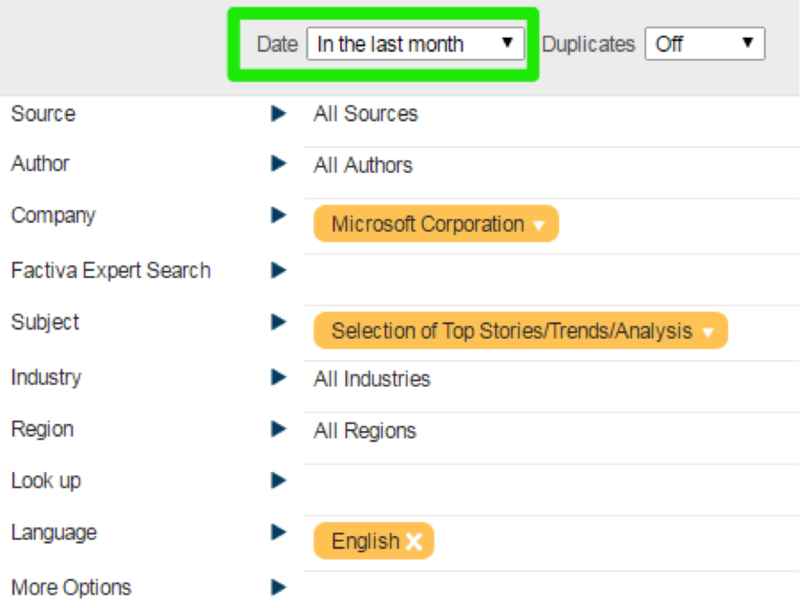 You can search by industry, company, or product keyword from the front page. Some of the reports are very broad, and others are quite specific. For example, my “software” search from the landing page yielded over 700 results. Each report is extremely thorough and organized in the same way—and can be downloaded to PDF. Each report also contains an iExpert Summary—which provides an infographic-happy “greatest hits” version for those short on time or who feel overwhelmed by the intensity of the full report. 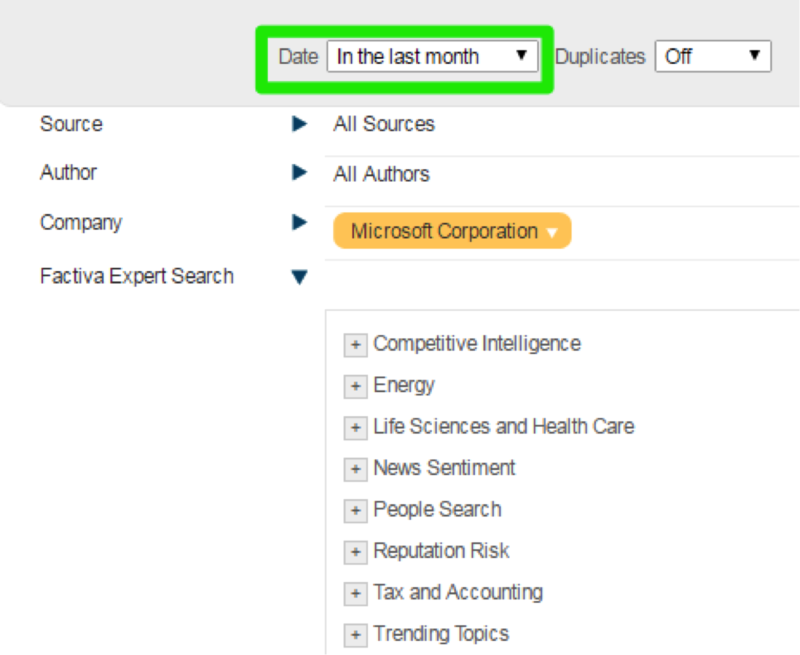 For company information, MarketLine Reports make an excellent one-stop shop. They are available through several different databases, including EBSCO’s Business Source product line. 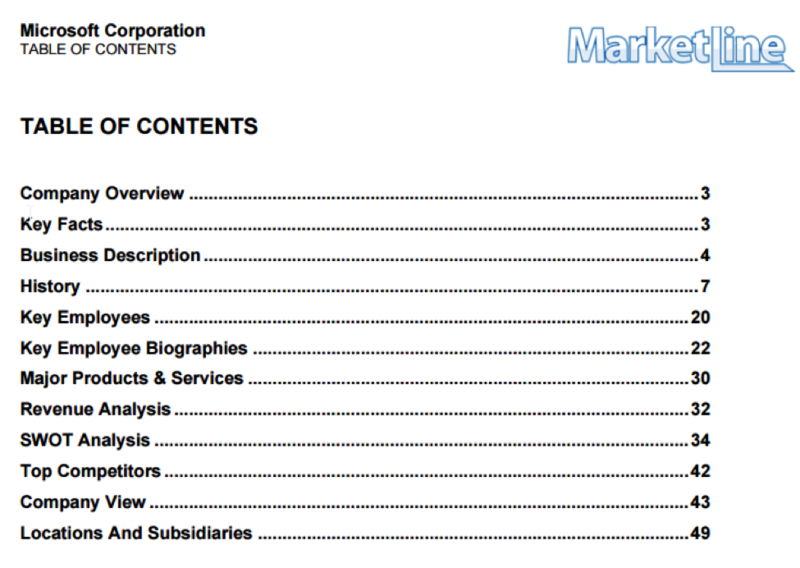 These reports are typically updated twice per year and are 35 to 50 generously spaced pages. It takes about 20 minutes for a thorough reading of a MarketLine Report of that length. 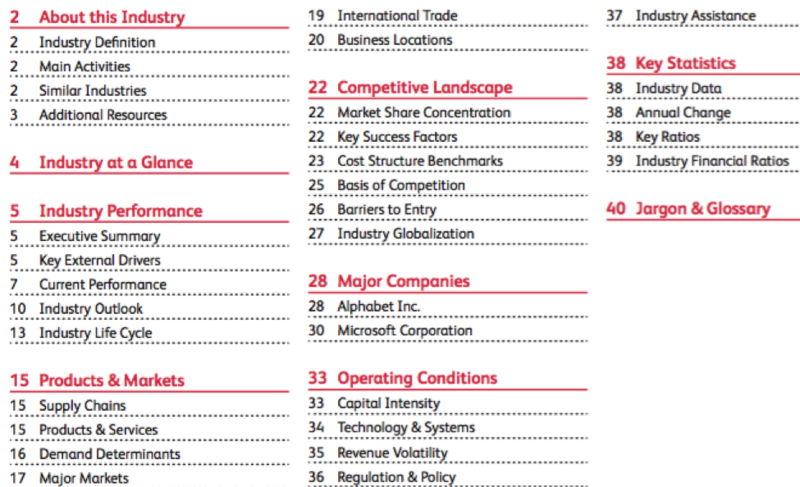 Though access points will vary, I found mine in Business Source Complete by going to “Company Profiles.” From there, I searched for Microsoft, and up it popped in PDF. You can get important quantitative information though Key Facts and Revenue Analysis—as well as qualitative information through History, Major Products & Services, and the insightful SWOT Analysis. I recommend using Factiva and its endless array of really smart filters for finding company information and more. Not only that, this is a very efficient way of getting verified, and non-fake news! By using Factiva, you will be able to bypass paywalls and cache-clearings and other internet indignities. It’s updated every morning. Another potent filter is Product Announcements, which will tell you what’s new, where the company’s headed, and what interviewers will be interested in talking about. If you don’t have subscriptions to the databases used here and can’t access satisfactory substitutes, I recommend looking at your local public library’s collection to see what they offer. Do you share reciprocal access privileges with a nearby college? If so, you might see if you can form a partnership. If you’re stumped, feel free to contact me and I will do my best to help you find alternatives. A live demonstration is a must for showcasing these services to students and stakeholders. Go where your students are—consider leaving the library and taking a laptop to the student center or career fair for demonstrations, questions, and general visibility. Form relationships with career services and student clubs to continually market the initiative. Get feedback on success stories and areas for improvement. If possible, I highly recommend offering dedicated appointments for individual students. This provides the chance to provide unhurried guidance and a positive, focused research experience. Encourage students to recommend the service to peers. Use social media and library signage to supplement the personal, on-the-ground, face-to-face mission. Survey students. Ask them to share their success stories. Keep decision-makers in the loop. Share feedback, student triumphs, and statistics. Not once—regularly. I know this is difficult for some librarians, but it is imperative. Strategic Approach to Interviewing: Best Practices for the MBA Market: The University of Washington’s Foster School of Business offers a thorough guide. Though it was designed for MBA students, it is appropriate for other audiences as well. Interviews & Offers: Princeton University has compiled a very helpful roadmap of preparing for all aspects of the process. Mergent Intellect is another database that can create lists of companies like Hoover’s. In my opinion, it’s a better resources because the database also includes information about the companies that can be helpful to job seekers like recent news, company family tree, employees, financial information, and it even can pull in job listings. Thanks for highlighting the other resources!